Students sit in front of new textbooks in one of 12 tented classrooms at Al Takiya Al Kasnazaniya camp for internally displaced persons in Karkh District, Baghdad Governorate, Iraq. “The impact of conflict, violence and displacement on education in Iraq is nothing short of devastating,” said Peter Hawkins, UNICEF’s Representative in Iraq. “Large numbers of children – those in host communities, displaced from their homes, as well as refugee children from Syria – continue to experience significant disruptions to their education, putting Iraq at risk of losing an entire generation to conflict,” he added in a news release. According to UNICEF, nearly one million children are displaced, 70 per cent of whom have already lost an entire year of school. Additionally, 67 attacks on schools and education personnel were reported in the last year. UNICEF estimates indicate that about one in five schools or approximately 5,300 schools are either severely damage or converted to shelter for displaced families or used for military purposes by parties to the conflict, making them unusable. Moreover, the schools that remain in use are overburdened with class sizes reaching as high as 60 students and operating in two or three shifts daily, which significantly reduces the amount of time children have to learn. The agency also reported that nearly 14,000 teachers fled northern Iraq due to the ongoing violence. As an overall response to the Iraqi crisis, UNICEF and its partners provided access to education to nearly half a million children in the last year. They also built 40 new schools and installed 141 prefabricated classrooms across the country, established 1,585 temporary learning spaces that enables more than 220,000 displaced children to continue their education and they also distributed learning materials for over 200,000 children. In addition, they distributed cholera prevention materials such as books, posters and pamphlets to over 5,000 schools. The agency said that it is coordinating with Government partners to distribute these materials to additional schools across Iraq during the first weeks of the school year. UNICEF reaffirmed its commitment to increase children’s education in Iraq, while adding that it requires $68 million by the end of the year, of which $12 million are needed immediately. 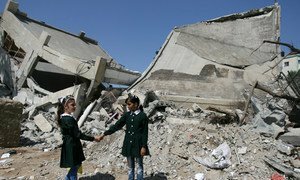 More than 13 million – that is the number of children who are prevented from attending school by surging conflict and political upheaval across the Middle East and North Africa, according to a new report released by the United Nations Children’s Fund (UNICEF) today.